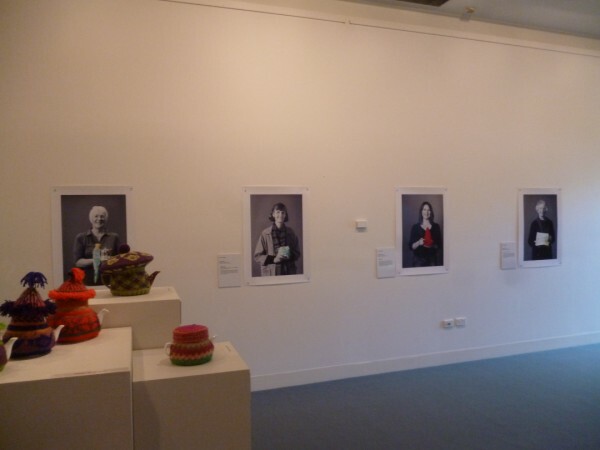 The Portraits of a teacosy exhibition is being run in conjunction with Jumpers and Jazz, an annual festival. 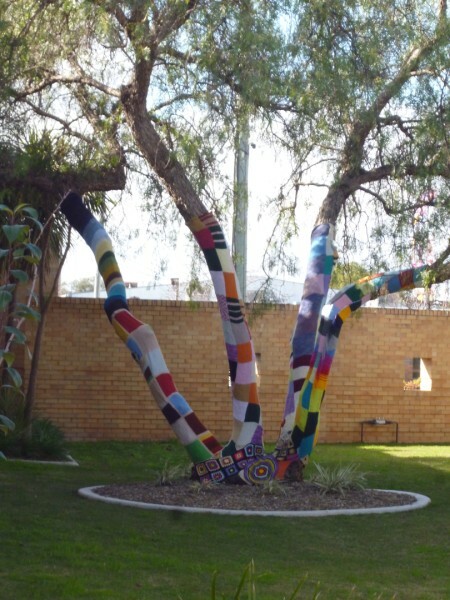 Here’s a tree outside the Art Gallery dressed in its winter woolies. 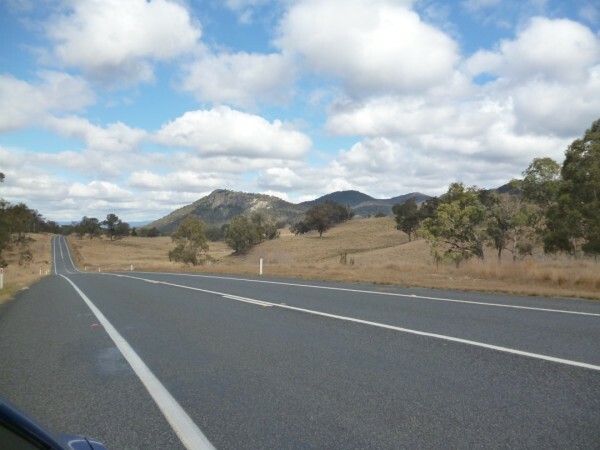 Having been away, I was looking at the Australian countryside with very appreciative eyes. 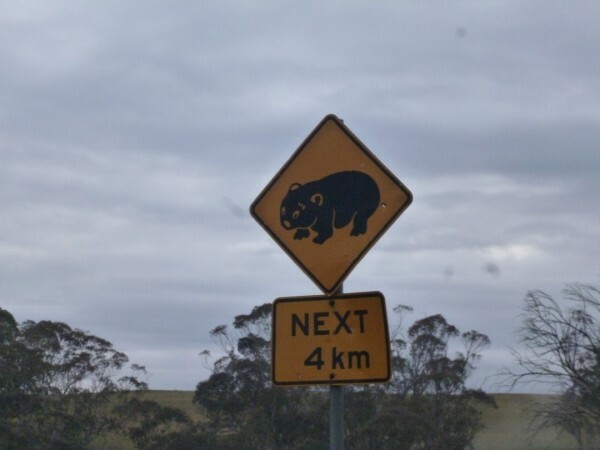 This is somewhere south of Tenterfied on the New England Highway, New South Wales. 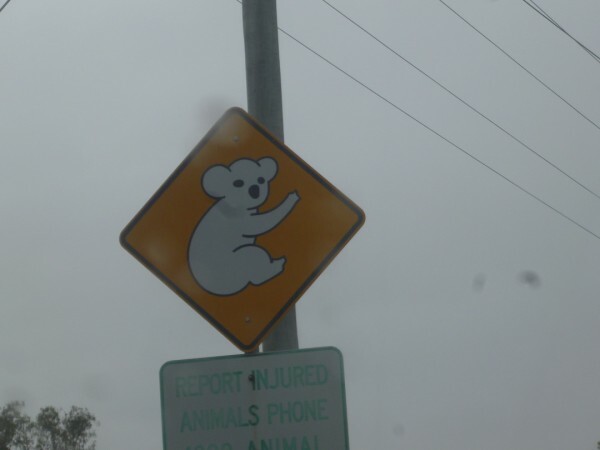 And just for fun, here are more road signs to my collection. 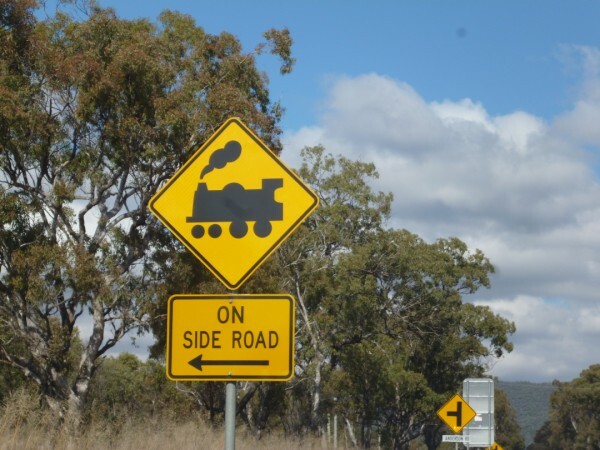 These were around Warwick and on the Thunderbolts Way between Walca and Newcastle, NSW. When was the last time you actually saw one of these? Both this and the next month will be a balance of commitments at Sturt and preparing work at home for the exhibition. It’s great to be back at Sturt. The gardens at this time of year are magnificent. 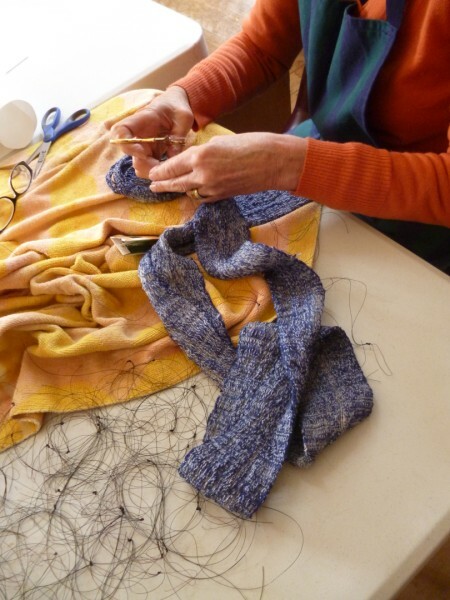 Another term is well under way in the weaving studio. 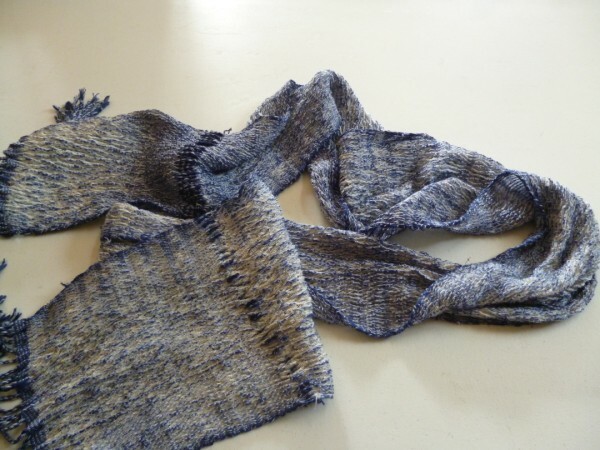 Maureen finished off her woven shibori scarf. Undoing the shibori. The fishing line also dyed beautifully in the acid dye bath. Maureen’s finished scarf. 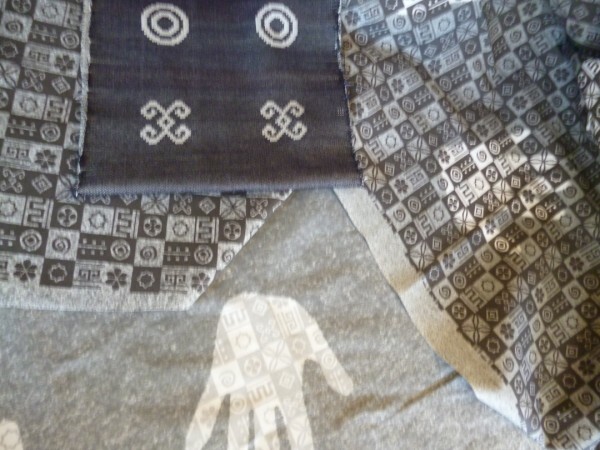 An interesting dye effect has been obtained by using a combination of silk and cotton. In the acid dye bath, the cotton didn’t dye. 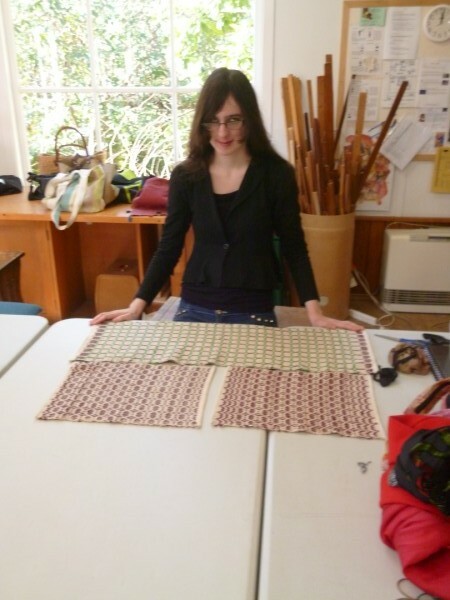 Tuesday finished off her tablemats. She had woven them last term. In finishing them she learnt how to use the sewing machine. : a very useful skill to acquire. Handwoven damask designs have been the inspiration for this fabric design. The negative space of the hands have been added by dye. The back, while the print design is not strong holds as much interest in some ways as the “front”. This is another sneak preview of work being developed for the solo. I have collected some work back from the framers. Mansons Framers of Wynnum did a wonderful job. Here’s a sneak preview of 6 Post cards from a series of 12. 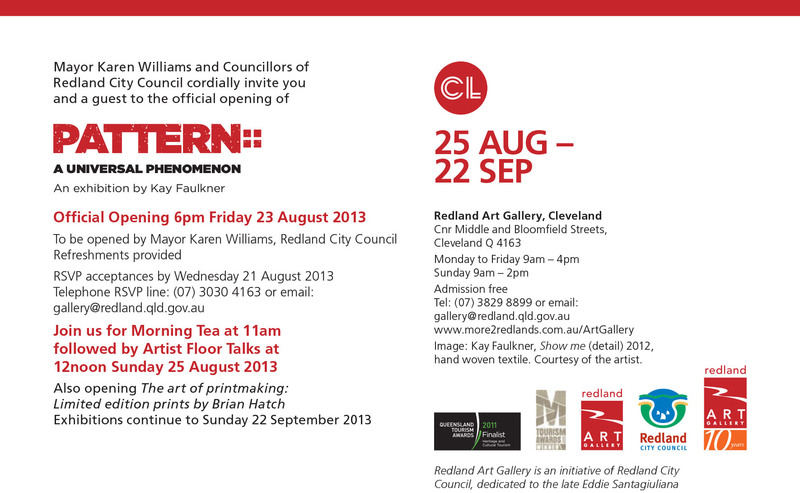 Redland Art Gallery have released the exhibition invitation. All welcome to both the opening, artist talk and for the exhibition for its duration. You are currently browsing the Kay Faulkner's Blog blog archives for August, 2013. 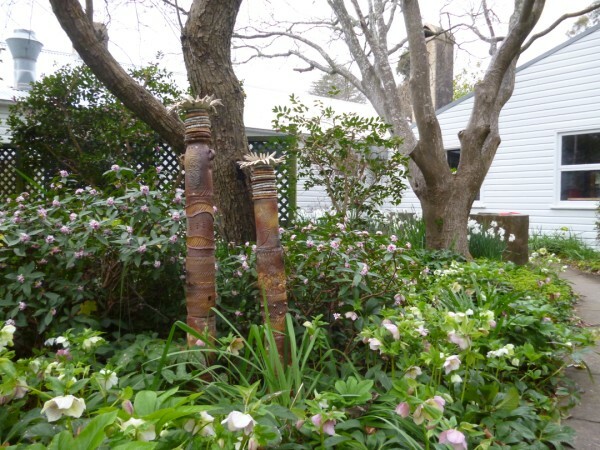 In May 2009, I had started this blog to record my adventures while completing an artist residency at Sturt, Mittagong, on the Southern Highlands of New South Wales, Australia. The residency finished in September. I have had such enthusiastic response from what I wrote that I have decided to continue to record my adventures both in and away from the studio. I would like to thank you, my audience for your support. 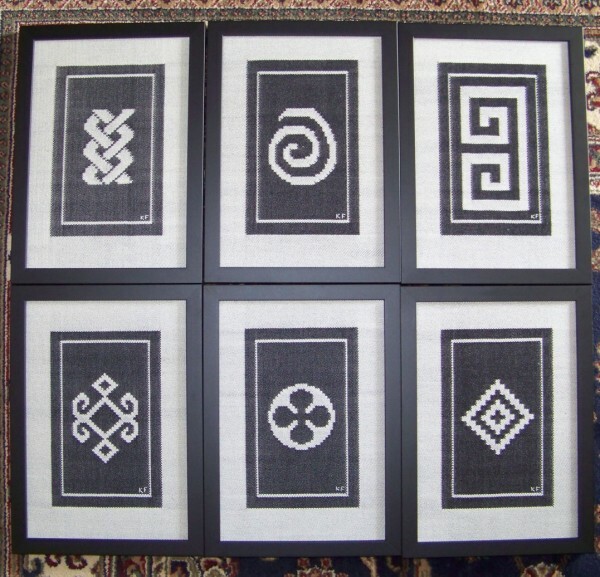 John Becker: Pattern and Loom.